Ann Packer's latest novel is one of those excellent, nuanced character studies that allows readers multiple points of entry when it comes to understanding and relating to the complex people she's created. Your reaction to the novel hinges upon which characters you identify with and which ones you're frustrated by—and I have a feeling those opinions are going to vary widely from reader to reader. The Children's Crusade is about one family: Bill and Penny Blair and their four children, Robert, Rebecca, Ryan, and James. The children's names (three R's followed by one lonely J) highlight the unfortunate family dynamic—the Blairs only planned on three kids, and James has been an outsider and a handful basically since birth. Bill is a pediatrician and a natural father, always patient and loving with the children. Penny is a housewife with thwarted artistic ambitions, constantly overwhelmed by her motherly responsibilities. The fact that it's so obvious, even to the kids, that their father is the better parent creates a fault line not just in the Blairs' marriage, but straight through the whole family. I related so hard to Penny, even as I recognized her selfishness, her inadequacy as a mother. I am certain that lots of readers will find her unforgivably narcissistic. But to me, Penny made a lot of sense. I have stood in a messy kitchen after a long day and felt like crying. I have ignored loved ones, people who needed my attention, because I was wrapped up in my own projects. I have recognized that playing with small children doesn't come naturally to me. Even as a kid myself, when I had friends over I'd eventually reach a point where I wished they would sit down, be quiet, and let me read. So I can't fault Penny for wanting a studio, a space of her own, and a little separation now and then from the hubbub of family life. It's just a shame she wasn't able to strike a balance between alone time and family time—and one could argue that Bill didn't make any effort to help her find and maintain that balance, either. The relationships between the four Blair children are also ripe for discussion. Ryan was my favorite, sweet and kind, his emotions always right on the surface. I can see how some readers would be totally put off by his touchy-feelyness, the same way his brothers occasionally are. But I loved how he assumes the role of peacemaker, always considering how the others feel. I also liked no-nonsense, cerebral Rebecca, with her fierce intelligence and big academic goals. Whiny, self-conscious Robert I had less use for, and James...well, James I'm still mulling over, and probably will be for quite some time. It's fascinating to me that a single book can be read and interpreted so many different ways, that it can inspire such a range of emotions depending on what personal experiences the reader brings to the table. I could probably write one of those self-important ten-page graduate-level English papers about it. Each character is so real and so complex. They gave me ALL THE FEELS, I tell you. 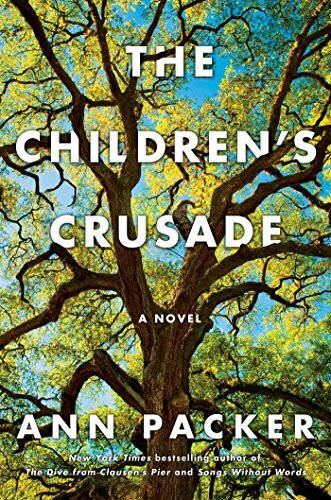 I highly recommend you read The Children's Crusade, but I also urge you to find someone to read it with you, because this is one book that demands discussion. I can already tell that I won't be able to shut up about it for some time. This should be a fun weekend for Adam! With regards to Scribner and NetGalley for the advance copy. On sale April 7.